What Is Protein? And Why Do I Need It? 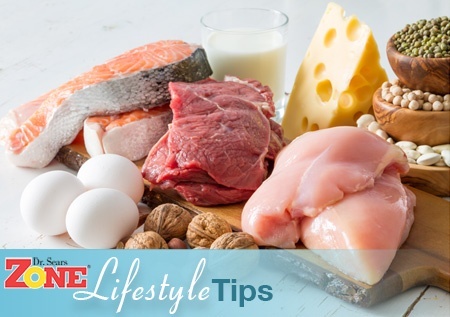 Home > Resources > Lifestyle Tips > What Is Protein? And Why Do I Need It? Protein is no longer the nutrient geared solely for body builders and gym buffs. While it plays a role in building and preserving muscle mass, its benefits are more vast, ranging from weight loss and maintenance, to improved mood. It's quite common to see commercials touting products and how many grams of protein they contain. While it’s important to have some at every meal and snack to help control blood sugar levels and to keep you full, you don’t want to overdo it on this nutrient either. So what is the right amount to consume? Plus, not all proteins are created equal, so which proteins are right for you? Here is the lowdown on what you need to know the next time you’re shopping for your protein fix. What Is Protein, and What Does It Do for My Body? Protein is an integral component in each and every cell in our body. It’s used to make enzymes, hormones and neurotransmitters, and is found in our muscles, bone, skin and hair. Non-essential amino acids – These are the 11 amino acids our bodies can make on their own. Essential amino acids – These are the 9 amino acids cannot be made by the body, and must be consumed in our diet. If a food supplies all the essential amino acids we need, it’s called a complete protein. Generally, animal protein sources provide all the essential amino acids (e.g., beef, chicken, turkey, dairy, eggs, fish). If a food lacks one or more essential amino acids, it’s called an incomplete protein. It’s the incomplete proteins in essential amino acids that are most important to replenish when you grab an energy bar or a yogurt as a snack. Protein Isn’t New, So Why the Hype Now? Protein isn’t a new wonder drug, but its popularity is rising due to its ability to help keep us full longer. This occurs because of its role in controlling blood sugar, fat loss and weight maintenance. Compared to carbohydrates and fat, protein is more filling.1 Even among protein sources, data shows there is variability in perceived level of fullness between them. In a study looking at the satiety of 38 foods (i.e., whether or not they made you full), participants had their blood sugar checked at various intervals and were asked to rate their overall fullness of foods across numerous food groups. Proteins were ranked from highest satisfaction to lowest satisfaction. Fish was ranked the most satisfying.2 Yogurt was ranked the least satisfying (Sorry, Cam Newton. That Oikos Triple Zero Greek Nonfat Yogurt may not fill you up). What’s the Best Way to Consume Protein? When choosing your sources of protein, be selective, as protein sources can be high in saturated fats or high in sodium. Aim for leaner, less processed choices. The Zone Diet was created to assure an optimal protein-to-glycemic load balance for improved hormonal control. It’s important to focus on making sure each meal has adequate protein balanced with appropriate levels of carbohydrate and fat to help stabilize blood sugar. How Can I Supplement My Protein? Protein bars, shakes and powders can be used to supplement or boost your intake in meals that are lacking. Be careful not to overdo it. If you are looking for a snack, aim for around 7 to 14 grams of protein. For a meal, aim for about 25 grams of protein. The key when using bars or shakes as a replacement is to pay attention to the balance of macronutrients. For every 1 gram of fat, you generally want to consume 2 grams protein and 3 grams of carbohydrate. For a post-workout recovery, the best time to supplement is during the first 15 to 20 minutes after the workout. This will help replenish muscle glycogen. An excellent recovery drink is 2% milk because its carbs and protein are perfectly balanced. Don't got milk? Our Zone Protein Powder can easily be added to whatever beverage you have on hand to help you get the ideal balance of protein to carbs. Plus, we even have several smoothie recipes with protein powder that you can enjoy. How Can Vegetarians or Vegans Get Their Protein? Because the American diet is so varied, it’s usually not a problem for vegans and vegetarians to consume all their essential amino acids over the course of the day. Plant sources usually contain too much carbohydrate relative to their protein content to get the optimal hormonal response. While it is true that consumption of grains and seeds is kept to a minimum in the Zone, for individuals who are vegan (avoid meat or animal products), soy imitation meat products have become better in taste and can replace animal protein in virtually every Zone recipe. Dr. Sears' book, The Soy Zone, was written to address this. If you are lacto-ovo vegetarian (96% of vegetarians are), then it is much easier to get your protein because you can include egg and dairy products. The protein selections are even greater when you include Zone PastaRx as your protein source. Females – Need about 20 grams of low-fat protein per meal (3 Zone Blocks). To balance each meal you’ll want to add 3 blocks of carbohydrate and 3 blocks of fat. Males – Need about 28 grams of low-fat protein per meal (4 Zone Foods Blocks). Then balance with 4 blocks of carbohydrate and 4 blocks of fat. To find your personalized requirements based on your gender, size and weight, try our Body Fat Calculator, because it shares your protein requirements in the results. Also be sure to try our Zone Food Blocks tool to see how many blocks are in the foods you eat. Protein is important regardless of your age or lifestyle. The key is consuming moderate amounts of good quality protein and a variety of types at every meal and snack balanced with low-glycemic carbohydrates. This way you can enjoy the benefits that come from key amino acids that are important for improved blood glucose control, preservation of lean body mass with loss of excess body fat, and better mood control. Paddon-Jones D1, Westman E, Mattes RD, Wolfe RR, Astrup A, Westerterp-Plantenga M. Protein, weight management, and satiety. Am J Clin Nutr. 2008 May;87(5):1558S-1561S. Holt SH1, Miller JC, Petocz P, Farmakalidis E. Eur J Clin Nutr. 1995 Sep;49(9):675-90. A satiety index of common foods. Shukla AP, Iliescu RG, Thomas CE, Aronne LJ. Food Order Has a Significant Impact on Postprandial Glucose and Insulin Levels. Diabetes Care. 2015 Jul;38(7):e98-9.